Hills Prescription Diet CD Multicare Urinary Care Wet Food Pouches for Cats have been formulated to provide nutritional management for cats with struvite crystals and related urinary tract disease. Made with the right balance of vital nutrients, Hills C/D discourages the formation of crystals in the urine by promoting desirable urine pH levels, which also reduces the risk of struvite and calcium oxalate stones. My cat has taken to Hills Prescription Diet CD with no problems at all. We had previously needed to try many foods and change regularly, but Hills has proven to be an instant success. My cat is a fussy eater and after being told he had to go on a special diet, I worried what he would make of the food. Well, I've never seen a cat enjoy his food so much, never a morsel left!! Thank you. 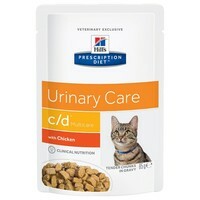 My cat really likes this, no problems since being on this diet for my cat either. The cheaper price does reflect the 85g pouch size compared to other urinary pouches that have 100g. Otherwise, can't fault it. Brilliant, my cat has had no reoccurrence of her urinary tract issues since using this product..couldn't ask for more for both of us!